As far as we know, Reagan slept the whole night last night. Of course, we didn't get to bed til after midnight and then I had to get up at 6am, so I've been dragging a bit today. We had a follow up appt with Reagan's immunologist bright and early this morning. Reagan had just woken up when we went to go get her out of bed this morning at 7:15am. She was a little startled looking (with big eyes and a tense body...keeping her head turned to the left for some reason) and a few times we thought we saw the fat lip, but she finally came out of it and was a content girl. Let me just say that I love Reagan's immunologist...I can't say that about some of Reagan's doctors. We don't see her a lot, but she's a very personable, intelligent doctor. We didn't have a lot to discuss, as Reagan has been healthy for quite sometime (everybody knock on wood right now). Even with the stomach flu she had a couple months ago, she recovered fairly quickly and didn't seem to have any lasting effects from it. We talked about the prophylactic Amoxicillin she's been on for over a year now and she agrees that it's probably time to take her off of it. I think we'll probably wait til we get back from our Bahamas trip to make that change, but it's definitely time. She also wanted to run some tests to look at her immune function. The last time these tests were run we found out that she had a very low immunoglobulin count (hypogammaglobulinemia) basically a suppressed immune system. Of course it would be expected that she wouldn't have immunity to any of the things she hasn't been vaccinated against (she only had vaccines at birth, 2mos, and 4mos). But a normal child who had never had vaccines, would not have an immune system with such low counts. It's obviously a result of her mitochondrial disorder (this doctor has found that many kids with mito have low immune system function). This is when she told us we need to be super careful with her...meaning no school, no church, basically not taking her anywhere that she would be exposed to large numbers of people (especially children). She said that there's always a chance that she's just a "late bloomer" and that over time, we'll see her immune system pick up (fingers crossed), but in the meantime we just have to continue to be super careful. Handwashing is key (don't forget that Daddy). Any sickness or exposure to anything (God forbid chicken pox or flu...anything along those lines), needs to be taken extremely seriously. Anyway...Reagan was awake and content the whole time we were there. When we put her in her carseat...she started to get groggy and then fell asleep. She woke when we got home (probably because our nurse accidentally set off her car alarm) and her OT was here waiting for her. She worked with her for a little while and although groggy, Reagan stayed awake. But she just kept getting sleepier and sleepier til finally she was OUT cold. She continued to sleep so we had to cancel both private therapy speech as well as speech through the school system! She was OUT! Her nurse put the pulse ox machine on her this afternoon just to monitor her O2 and heart rate and the alarm kept going off because her heart rate was dropping too LOW (an issue we never have). It was in the 70's, which is crazy low for her. I'm guessing it was a combination of her being in such a deep sleep and the fact that we've added a morning dose of clonidine. At first we thought maybe the clonidine was responsible for making her sleepy but I think it's really just her catch up sleep day. It would make sense anyway. She's more than just a little sleepy. She's out out. She slept the entire afternoon. 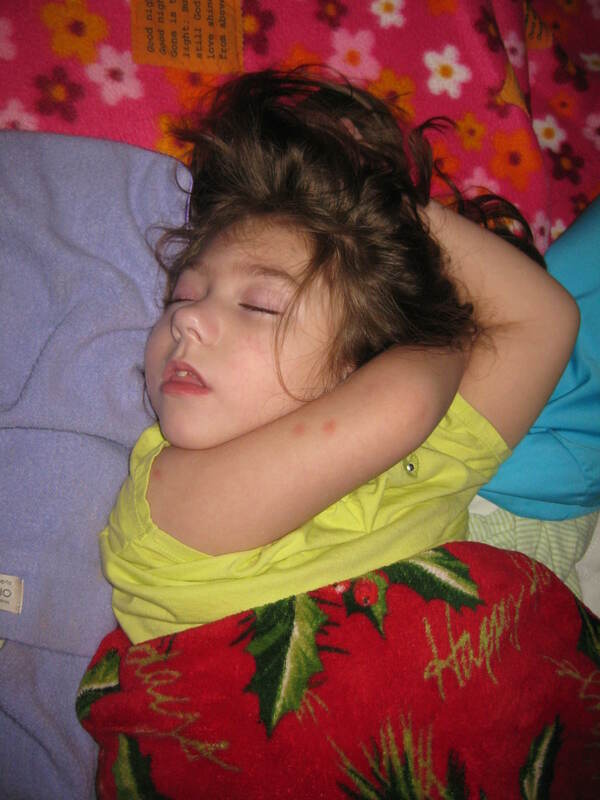 She kept sleeping until around 8:30pm when her pulse ox started alarming...her oxygen dropped down to the low 80's. I'm not sure if she had an apnea event or if maybe she had just kicked the pulse ox probe off her toe, either way, she was awake. Big giant eyes. She's been pretty precious ever since. Hopefully she'll still sleep tonight...Mommy is a little tired after our long day! This afternoon (right after OT). 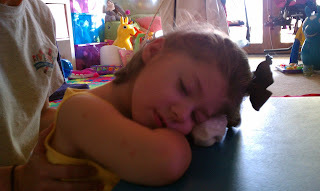 Mike was asking me the other day why we have so many pictures of Reagan sleeping. He thinks it's because we're always thinking it might be the last time that she sleeps for a while. We have to enjoy the sleep while we can!! Reagan didn't sleep much last night. We were supposed to have a night nurse but yet again our nursing company dropped the ball. She was happy though and had no problem laying in her bed...she just wasn't sleeping!!! Lots of laughing though. This morning she was a little groggy (and nauseous). Happy but groggy. She had back to back OT and then "school". She actually did pretty well during OT, but by the time her teacher got here, she was worn out. She pulled through though and by the end she had more energy and was acting more herself. She also had PT this afternoon and spent an hour in the stander. Busy day. She kept her happy attitude all day today. Lots of laughs, lots of smiles. It's nice to see smiles again. We've got an early day tomorrow with an immunology appt at 8:15am...so hopefully my girl gets some sleep tonight. Reagan was a real handful last night. She fell asleep around 10:30 and Mike put her in bed. We didn't get to bed til midnight and she woke not 30min later!!! I got up with her but I could tell she was still tired. She fell asleep on my lap fairly quickly, but woke the second I tried to get up to take her back to bed! I was able to get her back to sleep but this time I didn't even attempt her bed, I just put her in her brown chair in the living room (and relocated the snoring dog to our room). Mike thought he heard her moving around so he got up but she was asleep, so he just repositioned her and went back to sleep. I only had a few hours to sleep because I had to take my mom to the airport at 5am! When I got back Reagan was quiet, but I think awake. I let her be and tried to get another hour of sleep (I had to get up at 7am because I had a tennis match this morning in the heat). Reagan never fell back to sleep. She was in a decent mood though and I even got a few giggles out of her. She did get super upset this morning when her nurse was changing her diaper and she managed to get a hold of her finger and bite through the skin (no blood though). Other than that, she's been pretty mild mannered all day today. No smiles but a few giggles. Tonight I downloaded the fart piano app on my cell phone and that really got some laughs out of her. This girl loves her farts! Reagan's nurse hates that word...she won't even say it. When we were in Seattle I bought a book "Everybody Farts" for her to read to Reagan (knowing her aversion to the word) but instead she says something else. Can't say the F word!! Reagan's still very clammy and had one little burp/spit up this morning but I think she's headed in the right direction. Hopefully we'll have our happy (and sleeping) girl back in the very near future!! I miss those smiles!! Reagan slept most of the night last night. She fell asleep around 10:30pm and then slept til 3:30 or 4am. She woke fussy so I got up with her. She was kicking and screaming and going crazy, so Mike got up and took her from me. He was up with her from 4 til about 5:30am, when she fell back to sleep and slept til 8:15am. She was still pretty cranky when she woke up. She seemed to prefer being in her brown chair than being held today. She still had a nasty snarl on her face (and lots of chorea), but at least she was quiet. Pick her up and immediately she would start fussing. Tonight she's been a little better. You could hold her without her going crazy (although she's still really zoned out). Grandma even got a few laughs out of her when blowing raspberries on her thighs. I'm hoping she'll sleep tonight and wake up feeling more herself tomorrow. My mom and I did get away for a few hours this afternoon to go to the Abilities Expo in Houston. We saw a few interesting things. I was able to show her the wheelchair that we've been looking at. They also had this new car seat (that won't be available until next year) called the carrot...not sure if we should wait for that to come out or just get the Britax Traveler Plus. We also saw a mom pushing a little girl in a wheelchair with the cutest sunshade on it...turns out, the mom makes them and they are SO neat!! Emma's Exquisite Canopies. They're not cheap, but nothing is when it comes to special needs, and I think they are probably well worth it in the long run. Plus they are completely customizable. She said if there's a fabric or pattern you want, just let her know and she'll do her best to work with you. 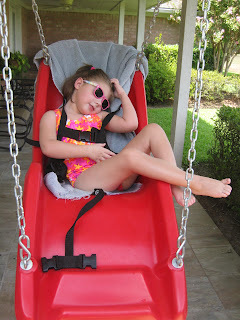 We'll definitely be getting one, when we decide on which color scheme to go with on Reagan's wheelchair. Reagan has had a horrible day today. She slept fine last night and was still asleep when I left this morning at 8am to go pick up my mom from the airport. When we got back, we could hear her screaming before we even opened the door. She was miserable. This morning she pretty much screamed bloody murder nonstop. It was a blood curdling scream like she was in pain. We gave her Lortab but it didn't seem to do anything. We had to restrain her arm to keep her from biting herself and her hands and whole body have been very sweaty/clammy. This afternoon she was more fussy/yelling than screaming crying...but still definitely miserable. She hasn't really had one good awake moment all day long. It's frustrating because my mom is here (probably for the last time before we go out of town) and was really looking forward to seeing her little princess. My mom and I also had plans to go shopping all day (to finish shopping for the Bahamas) but instead we were only went for a couple hours so we could come home and relieve Mike. When Reagan is like this, it's really hard to maintain your sanity. The nonstop screaming/moaning...it's tough. It grates on your nerves. Thankfully, she did have periods where she'd doze off and we could get some relief from the craziness (although not nearly as long as we would have liked). I'm hoping she'll sleep tonight. We're all pretty worn out from this day. Please keep her in your prayers!!! I'm not sure how much Reagan actually slept last night. I think she slept for a few hours but then we could hear her "talking" over the monitor. She went on and on...at that point, she was clearly awake for good. We tried to continue to sleep but she kept cracking us up! Finally Mike went in there and laid down beside her for a little bit, when he got up and came back into our room, we clearly heard her say DA over the monitor. So cute! She's been a sweetie all day today. The chorea was clearly reduced, she would kick around a little, but there were times where she was totally still and relaxed (way different from yesterday). Her temperature regulation was back to normal today as well. The only thing that was still "off"...she was super spitty all day long and threw up quite a few times this morning. No clue what that was about. She only had one therapy today...speech. She interacted with the therapist and seemed to be enjoying herself. She really was a sweet girl all day today. She gave us giggles (in response to a stimulus) and lots of smiles. We just had to be careful with positioning her, it seemed any pressure on her tummy would make her nauseous. And we couldn't lay her down at all because she'd start choking on her spit. She was precious though...I'm just hoping she'll get some sleep tonight. Reagan has been a goofy one today. She slept last night but she was awake and moving around when we went to bed. Now I woke a few times in the middle of the night and each time she appeared to be asleep. This morning we found her laying in bed awake, completely quiet and still, at about 8:45am. She still had sleepy eyes, but she was definitely awake. Once we picked her up, she came to life and she's been going strong ever since. Actually she's been a little wired today...OK a lot wired (but still very smiley). Lots of movement (chorea)...she's been going, going, going all day long. 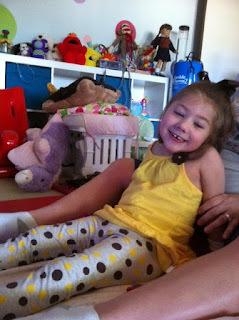 She had several therapies today (vision, speech, and PT) and all went well. During PT we had an equipment person come by and talk to us about car seats, walkers, and wheelchairs. Interesting stuff. Other than the car seat (the britax traveler plus is the only real option for Reagan right now), we didn't make any concrete decisions today. Lots to think about. 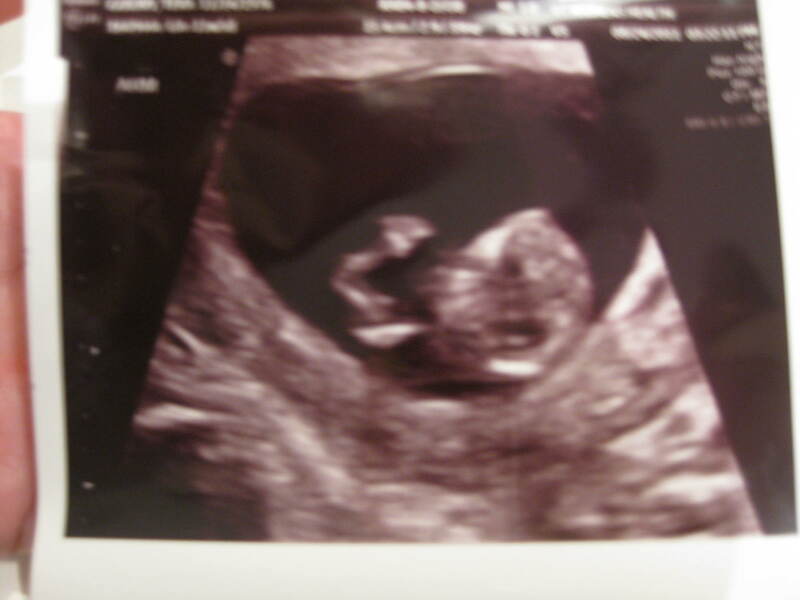 Reagan has kept us on our toes today though, so we've kept busy. This afternoon she had a big throw up that kinda came out of no where (and another tonight). Then we gave her a bath but she's been so sweaty ever since (because of all the constant movement)...her hair has never really dried. I'm not quite sure what's going on with her. We're now seeing all signs and symptoms of a "bad" day, but with no fussiness. She's sweaty, nauseous, moving nonstop, hands and feet are cold and sweaty...but she's just as happy and smiley as can be!!! I'm clueless as to what's going on. Maybe her body is just trying to fight off the bad days...I sure hope she's successful. Sleep does not look like it will be happening tonight (for me or this hyperactive girl). Please keep her in your prayers! Reagan slept well last night and then actually slept in this morning til about 10am. She woke happy and smiley. She had OT this morning and did great. Then her teacher came by to talk, she'll be starting next week. Same teacher, the one we love, so that's great. Then she had speech. Another busy day. Next week (when all the school therapies are in full swing) will be even busier. Reagan was so cute this afternoon. I laid down beside her and she was "talking" to me (she's been doing this a lot lately with me). It actually sounded more like singing (like Ariel from the little mermaid). I started singing back to her and then she would sing back to me...it was SO cute. By the time the nurse grabbed the video camera, she stopped performing. She has felt a little sweaty/clammy today (her whole body), but otherwise it's been a perfect day for our little one. 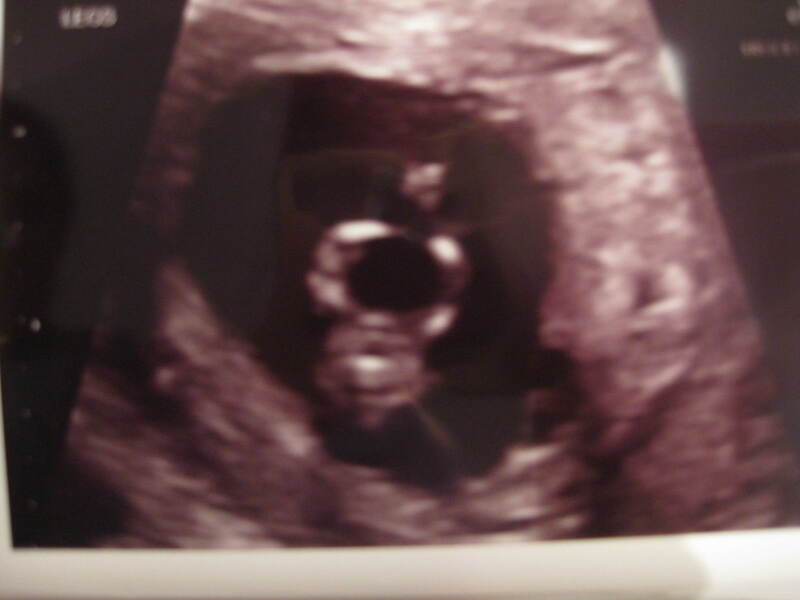 Today I went in for my 12 week nuchal translucency screening, since I'll be over 35 (by a few months) when I have this baby, I'm in the "high risk" category. Good news, everything looks good. 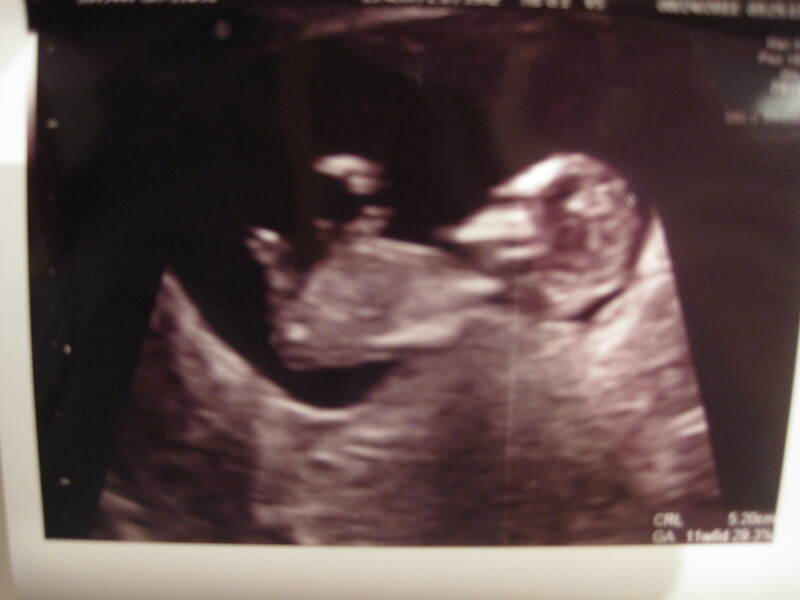 They still haven't completed the entire test (which includes some blood work), but the ultrasound results were good. My last ultrasound was at 7.5 weeks and it was very fuzzy and hard to tell what was what (looked like a fuzzy blob). In this one, you could actually see a lot. It looks like a BABY. It was even moving around. Weird. I'm still dealing with nausea. Never throwing up, just that sick feeling that makes you miserable. Hopefully that will be over with soon so I can start eating normally (ie healthy) again. Lately it seems all I can eat are carbs. I went from a low carb/high protein diet to an ALL carb diet! Not good. My complexion is also going crazy. I went from having a very clear complexion to having bumps all over my face and constant breakouts. Ugh...these pregnancy hormones are really doing a number on me. It was exactly the same with Reagan. Other than that, my only continuing issue is my back. My doctor seems to think it's pregnancy related but I don't know. It's not as bad as it was originally, but I still feel it off and on throughout the day. That's all. That's the pregnancy scoop. 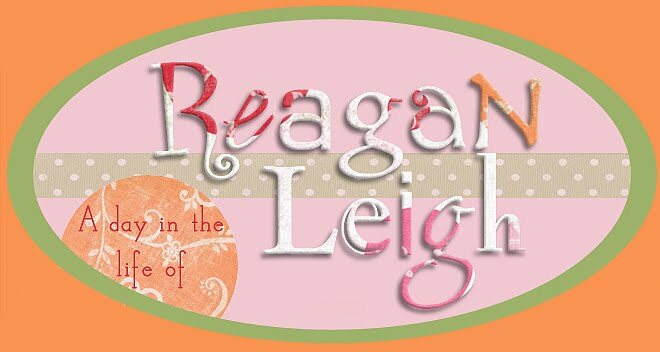 I try not to talk too much about it on the blog, because the focus here is Reagan, but I would appreciate your continued prayers for a smooth pregnancy and healthy baby!!! 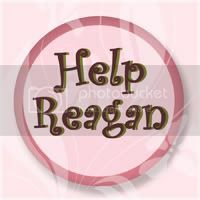 Reagan slept like a rock last night (of course...we had a night nurse)! She woke around 8am this morning, as sweet and smiley as can be. She's been in a great mood all day today. A little groggy at times, but precious. She had OT this morning and PT this afternoon...check out the pictures below of her playing possum during PT. She was trying to fall asleep but we wouldn't let her. She did, however, take a little cat nap tonight (she dozed off while watching a movie). She definitely seems to be feeling more "herself" today. That's a good thing, because tomorrow she's got a busy day of therapy ahead of her. Rest up little one! The second two during PT this afternoon...so pathetic! Well Reagan has thrown us for a loop today. Not in a bad way, just unexpected. Reagan slept the whole night through last night and then slept pretty much the entire day today. Since her last bad cycle wasn't really that bad, we were thinking she would probably skip her sleepy day. Nope. Today was the day. This week school started and this morning, we thought, she was supposed to have her first visit by the school speech therapist. She was supposed to be here at 11am, so around 10:30am we started "trying" to wake Reagan up. We changed her diaper, changed her clothes, fixed her hair, moved her out of her bed and into the playroom...nothing. We could not get her to wake up. As it turns out, it didn't matter because the speech therapist was a no show anyway (and since she's new, I didn't even have her name or her number to call and find out what happened...turns out it was just miscommunication and she'll be coming next week). Reagan finally woke up around 12:30 but she was still very out of it and fell back to sleep quickly. All afternoon it seemed she would wake up...she'd roll to her side and stretch and then she'd be back out. Each time you think she's going to wake up, but each time she just dozes right back off. I got a call from the nursing agency to tell me that the night nurse was scheduled to work tonight. I told them it wasn't really necessary, Reagan slept all day and I'm sure will sleep all night tonight. But they spoke with the nurse and apparently she really wants to work (I guess she needs to get paid), so since she was already scheduled, I felt obligated to just let her come. So it looks like we're going to have a night nurse tonight (for no apparent reason). It's crazy, when we need someone, we can't get anyone. And when we don't need anyone, we have to let them come! Very frustrating!! One arm wrapped around her neck and the other up in her hair (of course)! Reagan has been a precious girl again today. She slept well last night (as far as we know) and woke all smiles this morning. No more laughing, but plenty of smiles. Her hands are still clammy and her feet still cold, but other than that, all signs of bad days are gone. Since all looked good, we decided to venture out to a baseball game today. Normally we don't take Reagan out in crowded public places like that, but a whole group of mitochondrial kids and parents were going, the tickets were free, it's not yet cold/flu season, and Reagan was in a great mood...I figured, why not. We had a whole string of handicap accessible seats at the top of the section with plenty of room to move and an unobstructed view of the field, it was pretty nice. Reagan seemed to enjoy being out, but she wasn't crazy about all the yelling. When the crowd got loud, you could see her smile headed toward a frown, but she recovered each time and we managed to stay tear free. 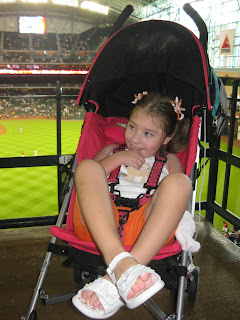 By the end of the 6th inning Reagan was beginning to get tired, so we decided it was time to head home. She never fell asleep though and by the time we got home, she was wide awake again. We really couldn't have asked for her to be any better today...super low maintenance and oh so smiley. Boy do I love this girl! This was Reagan's handicap accessible seat...pretty nice view! Reagan has been a doll today. I'm not sure how well she slept last night because we kept hearing her making cooing noises off and on all night. This morning I went in and laid beside her and immediately she fell back to sleep and slept in another hour or so. She's been super sweet and smiley all day today. Happy to be held, happy to lay on the floor, happy to sit in her chair, just all around happy (especially to have her hand free and up in her hair). And giving us little giggles all day long. She did have one random throw up this morning, but other than that, she's been perfect. She hasn't taken a single nap, so hopefully she'll be able to get some sleep tonight. And hopefully we're done with those bad days for another good while. Reagan was pretty restless last night, she kept moving around but eventually she'd go back to sleep. She only woke up fussing once, requiring me to sit up with her til she fell back asleep again. We were up for good at 7am though. She's been a little more mellow today. She had her fussy moments, but all in all she was much more laid back than yesterday or the day before. She definitely prefers to be held. Lay her down to change her diaper and she gets quite mad. She's still pretty pathetic giving us the sad face a lot. We have heard a few laughs out of her today but some of them sound more like a laugh/cry than a laugh. Her hands and feet are icy cold today (although not as damp as yesterday). She continues to be easily startled/sensitive to noises and any air on her face (be it from the A/C or you just breathing on her). All in all, not a terrible day, but not a good day either. She fell asleep around 10:30 tonight but she's already awake again. We're just keeping an eye on her and hoping she'll fall back to sleep! Prayers for better days and decent sleep for my girl! Reagan was up again last night. Mike took the first shift. He was up with her for a while, most of the time she was asleep in his arms, but she was very restless and he was afraid to lay her down. Eventually he put her in bed and she stayed asleep. She didn't sleep too long though and I was was up with her from 4:45am til 6am...and then she was back up by 8am. She hasn't been as fussy today. She's obviously miserable and not feeling well, but she's doing a lot less crying. Her overall heart rate is elevated...she's in the 130s resting and anywhere from 160s to 200 when crying. We debated a lot about whether or not to take her in to get the portable EKG put on her...obviously yesterday was the optimal "bad" day to do it, but without a nurse, I had no way to get her in to the medical center by myself. So finally we decided we would just go ahead and take her in this afternoon and she's been pretty mellow ever since (go figure). She's still tense, but she's only had one crying episode since we've been back. She looks so pathetic though. She's got the big, sad eyes and a pouty bottom lip...she looks like she should be on some poster to raise money for sick kids! Poor girl. Her hands aren't too terribly cold, but they are extremely clammy. She's also got a very strong "bad day smell" and been very sensitive, startling/gasping at even the slightest hint of air on her face. She's not going for her hand a ton, but we decided to just put the left arm restraint on her to be safe. Of course, this afternoon she did bite her right hand and even though it was covered by a blanket, she still left a rim of teeth marks in it. So things are definitely still "off" over here. Hopefully this string of bad days won't last too terribly long and she'll be feeling better in no time! Your continued prayers are much appreciated! I laid her down to change her diaper and she struck this disco pose! I had to take a picture (the little fanny pack around her waist is the portable EKG). Reagan was a handful last night (and today for that matter). She finally went to bed last night some time around 11pm. But she woke back up at 2:15am and refused to lay in her bed...she cried until I picked her up, then she was fine. She was actually pretty wired...kicking around like crazy in my arms. I stayed up with her from 2:15am-4:45am when she eventually fell back to sleep. It was short-lived though and she was back up by 5:30am...this time Daddy got up with her. He tried to lay her back down a while later, but she was not having it, and he had to get back up with her. Sometime between 6-7 he got her back to sleep and he came back to bed. I got up before 8am...knowing we were supposed to have a nurse that had only worked here once (I didn't want her to knock on the door and make the dog bark...waking up Reagan). So I waited. It appeared we had a no show. At 8:30am I called the nursing agency. They couldn't get a hold of her either. Needless to say, she never came and I never heard a word back from the agency (big surprise). Reagan slept in til sometime around noon when she woke with a vengeance. Nonstop screaming crying. I had gone to the grocery store and by the time I got back, I think Mike was about to have a nervous breakdown. He had had all he could take and left to go play golf (he's off all week this week). After a couple hours of screaming nonstop, I broke out the Lortab (tylenol/hydrocodone)...a few minutes later, she was sleeping peacefully. That lasted not quite 2.5 hrs and then she woke screaming again. After that, it was screaming, short nap, screaming nonstop, short nap, etc... I've drained a good amount of fluid out of her g-tube, so things are definitely off in her GI system as well. But overall, she's just all around miserable. This was what we were hoping to avoid...and we did for over two weeks...but here it is again the "return of the bad days" and we don't like it one bit! Please keep her in your prayers!! So, last night Reagan slept like a rock...but she woke up at 5:30am and the nurse picked her up. I'm not sure if she had left her alone if she would have fallen back asleep or not. My guess is yes. Tonight we are going to try it without the nurse and see what happens. I looked back and the last time Reagan didn't sleep through the night was two weeks ago...an all time record...but also the last time the night nurse worked. Of course that was when she was recovering from a bad streak and not sleeping anyway...but it's amazing to think that she's been sleeping through the night for two weeks straight!!! Amazing. Definitely an answer to prayers!!! This morning when I got up Reagan was awake and sitting in her brown chair in front of the night nurse. I got down and talked to her and immediately she started "talking" back to me, like she was doing yesterday. It was too cute! 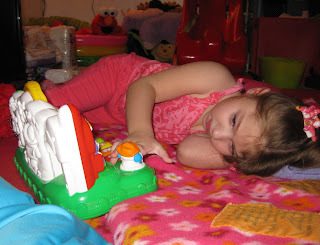 Then I moved her into the living room and had her down on the floor in front of a movie while I fixed her medicines. Reagan's day nurse came in and we chatted and then I tried to pick up Reagan...she gave me the fat lip and tears!!! ME!!! I couldn't believe it! She was fine just 30min earlier and now she was crying when I picked her up! Crazy. She was fine for her nurse so she took her into her playroom. Mike came in and tried to kiss her good morning...same thing, fat lip and tears!!! Helloooooo?!?!? We are your parents!!! What's funny is that she does this to Mike all the time, and on a rare occasion she'll do it to me, but she's NEVER done it to both of us at the same time!!! Then her OT came and worked with her and she was as good as gold. She actually had the best session she's ever had with her! Mike kept saying, "look at her in there smiling for a complete stranger!!!" (not really a stranger, but she doesn't see this therapist a lot, certainly not enough to prefer her over US) I'm beginning to wonder whether this is just her being feisty or if she's just not feeling well. She has had a low grade fever yesterday and today (99) and today her whole body felt clammy. Something just doesn't look right to me. Maybe she's fighting off bad days. Who knows. You know how yesterday we took Reagan for a walk...we were only outside maybe 15min max...today we found multiple mosquito bites to show for it! On her leg she's got three huge ones, all in a row. She's got two little ones on her neck and three little ones on her arm! Those mosquitoes got her good. What's crazy...I didn't notice any mosquitoes at all (or I would have sprayed her). I didn't think they hung out in 100 degree weather with no sign of rain. I guess I was wrong! What's worse, Reagan is particularly sensitive to mosquito bites and it usually takes weeks for them to finally go away! Ugh. Well, I'm not sure what tonight holds, but please keep it in your prayers that she can pull out of this funk and continue to give us more good days (and sleep-filled nights)! Today has been another great day for our girl. Reagan slept in til 11am!!! She woke up smiling away and has been a sweet heart all day. She really prefers laying on her left side...and today she was going to town swiping at a musical toy we had laying on her left. She just couldn't get enough of it. She just kept hitting it over and over again! The only problem...she rolls from her side onto her tummy and then makes her gj-tube leak. 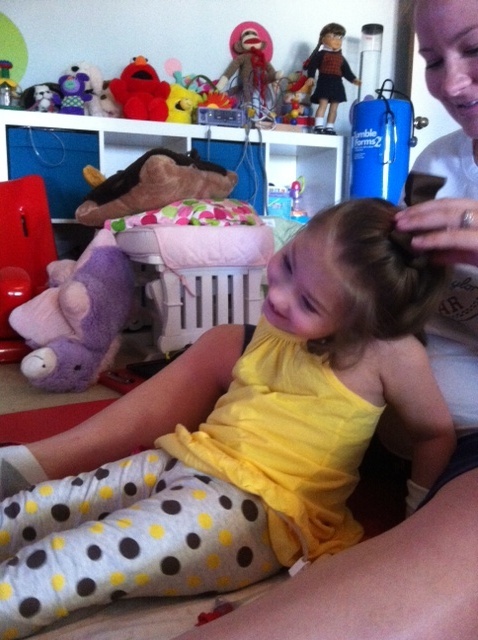 She didn't have any therapies today so her nurse took over stretching duties and I fed Reagan some peach cobbler that I put in the blender (and a bite of blue bell ice cream). We also took her for a walk this afternoon (although we didn't go far). I think we did a decent job completing the tasks on Grandma's checklist. One super cute thing Reagan was doing today...every time I'd come over near her or pick her up, she'd start "talking" to me. She wasn't doing it at all, unless I was near her. It was SO cute!! Like she had something very important to tell me. She must have done it 20 different times today...but only when I had her or was near her. Just precious! Of course for Daddy, it was the opposite. When Daddy would talk to her, she'd get really serious. And then tonight Mike yelled out "Are you ready for some football!?!?!" and Reagan broke out into tears!!! It scared her!! Poor thing. She calmed down (eventually) and has been fine the rest of the night (and nicer toward Daddy). One interesting thing...we have a night nurse scheduled to work tonight. Even though Reagan is sleeping better than she has ever slept...ever (knock on wood), they scheduled this nurse to work last week and now I don't feel like I can just cancel her last minute! So my guess is she'll end up watching the monitor all night long while Reagan snoozes! Oh well. We're not used to Reagan sleeping...this is something completely new for us. Hopefully it lasts! Reagan slept the whole night through and woke up right around 10am. She was all smiles again! She's been super sweet and precious all day today. Grandma took her outside to swing and then "swimming" in a tiny pool that was way too small for both of them! Reagan seemed to enjoy herself and she got some much needed sun exposure. Grandma keeps warning us that if we don't get her out in the sun more before our trip, she's going to burn like a crisp! I know she doesn't get out much but she does have her Daddy's skin, so I think she'll probably tan very easily. The problem is less with the burning and more with overheating I think. That's something that we notice just taking her outside for short periods of time...those little cheeks get bright red and she becomes drenched in sweat. 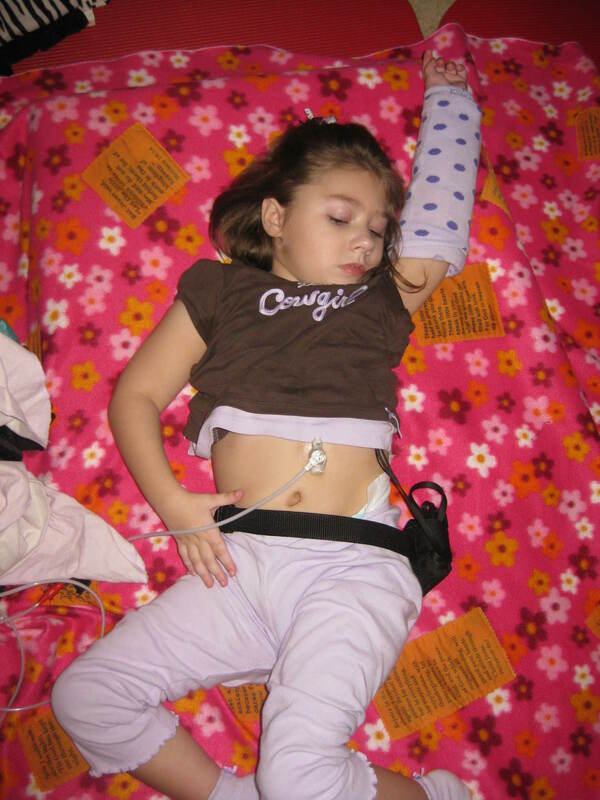 Temperature regulation is a common problem with kids with mitochondrial disorder. We're in the process of getting a RPCM cooling vest for her. Most kids I know that use a cooling vest have the ones that cool by evaporative cooling. The problem with those is that they leave their clothes wet and they only work in climates with 85% or less humidity. That's just not going to cut it in Houston. We really needed something we could put on her when we're out and about and that we could remove and not have her soaked! This vest cools with removable cooling packs. I'm hoping this one does the trick and I'm pretty excited to try it out. I'll definitely let everyone know how it works. Right now we're just hanging out with our girl and loving these good days!!! Reagan slept in this morning til 10am! She woke up smiling and was a real sweetie. Mike and I left her with Grandma so we could attend our niece's first birthday party. It was a good thing we didn't take Reagan, because she fell asleep only 30min or so after we left and then continued to sleep all afternoon (about 6.5hrs total)!! I have no clue why she was so sleepy today!!! It's very unusual for her to sleep that much unless she's recovering from a bad streak! She woke up and was a sweet precious girl. Grandma fed her some baby food (all the while complaining that we aren't feeding her often enough) and she seemed to enjoy it, although she did make quite the mess. Reagan was only awake for maybe 3hrs before dozing off once again. She was in bed, sound asleep by 10:15pm. On one hand, I'm glad that she's getting some good rest...but on the other hand, I'm concerned as to why she's so sleepy and would like to see her a little more alert so that we can enjoy our happy girl. Please keep her in your prayers! Reagan was up late again last night but she eventually dozed off and went to sleep. We didn't hear her all night, so we'll just assume she slept the whole night through. She woke up around 7:30am and was just as cute and precious as can be! She was wonderful all morning long. The only little mishap happened when I turned the vacuum cleaner on. It freaked her out a little and I thought I might have really upset her and she yelled out, but she recovered and was a good girl once again. I can't imagine her being much better than she was today. She's been cuddly, smiley, giggly, and at times even talkative. Tonight Mike's parents came from out of town to stay with us. His sister's little one is having her first birthday party tomorrow, so they came in for that. At first I was thinking we would take Reagan to the party (assuming she was still having good days), but I just don't think it's worth risking her getting sick and messing up this good streak. My mom is coming in tomorrow morning, so I figure she can hang out with Grandma while we go to the party for a bit. Tonight Reagan has been a little more high maintenance. She got all teary eyed anytime we started talking amoungst ourselves. Someone...insists on being the center of attention. I wonder if that's just her being a spoiled 4yr old. She does have us wrapped around her little finger, that's for sure. Here's to another good night's sleep and hopefully another good day for our girl tomorrow! Today has been another weird one for Reagan. She was difficult to get to sleep last night, it wasn't until after midnight that we finally got her to stay down. Mike said he heard her off and on making sounds during the night (I must have been out) but thankfully she kept falling back to sleep. She woke up this morning right around 8am and she was giggly but a little on edge. She was very high maintenance and required your undivided attention to keep from breaking into tears. Finally around 11am the tears started up! She cried off and on (mainly on) for close to 2 hrs and then stopped when her speech therapist got here. I don't know if it was just the change of pace or what. 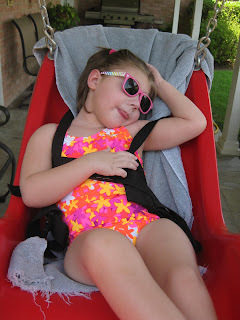 She was still very high maintenance but she held it together and made it all the way through PT without any meltdowns. It wasn't until right around 6pm that she started getting teary eyed again (and super spitty). We worked through it and she's been giggly and precious the rest of the night. I'm still not quite sure what's going on here. Her last real "bad" day was two Sundays ago! Now don't get me wrong...today was a little shaky. But at this point we're still only seeing slight fussiness and not any of the other usual "bad" day/dysautonomia symptoms (clammy hands/feet, sleeplessness, biting, etc). I'll definitely take it! Now if we could just get an extra long stretch of good days while we're in the Bahamas, we'll be good to go! So this morning we were ready. I had all of Reagan's stuff laid out, ready for her to wake up (in a not so great mood), so we could take her in and have the Holter monitor (24hr EKG) put on her for a "bad" day. She woke around 9:30, but she was not fussy, a little wide eyed but not fussy. Once picked up, she actually started laughing!!! We have a new nurse filling in today and Reagan really seemed to enjoy the way she was reading her stories (and singing to her). I kept hearing laugh after laugh from the other room (purposeful laughs...in response to something). Then it got quiet and I went in and Reagan was asleep on her chest! We got her awake just in time for OT (boy has she missed a lot of OT lately) and she actually did a decent job...although she did get a little irritated with having to bear weight through her arms. A little while later she had speech. Thankfully she was awake and cooperative for that. Her therapist liked how she seemed to be responding to her with her laughs. Her way of communicating with us. She's been really sweet, giggly, and cuddly all day. Talk about a shocker. I was really prepared for a bad day today. I'm certainly not complaining...just shocked. Even though she slept the whole night through, she's been a little sleepy today and her eyes are a little bloodshot. We've been getting yawns all day. But put her down on the floor (like to watch a movie) and she's rolling all over the place. It's weird...when you're holding her she's fairly still and a little groggy. But when she's left to her own devices, she's actually very active, lots of moving, hands in her mouth, hands in her hair. I give up...I can't read this girl anymore. I have no clue what to expect. I'm hoping this change of pace is due to the clonidine. Maybe it's actually helping us to phase out the bad days...that's the goal anyway (although we're still at a very low dose). Thank you for your continued prayers for this precious girl! Reagan has actually had another pretty decent day (knock on wood)!!! She slept through the night til 9am again. I found her completely sideways in her bed this morning! She was surprisingly calm and dare I say even a little happy! We've gotten quite a few laughs out of her today...although some of them have been the sad, pathetic laughs. Then around 11am this morning she had a meltdown. That's it, we thought. The bad days are starting. But she only cried for 5-10min and then fell asleep. When she woke up, she was fine. Her PT came and worked with her and she was actually doing a great job sitting at her little blue bench. Head control looked great. Then her therapist stretched her (which she did fine with) and put her in the stander. She didn't last long in the stander before she started fussing and then crying. She recovered, although ever since she hasn't been quite the same. You can tell she's on edge. The fussiness could take over at any moment, but so far, she's still hanging in there. She's been slightly gaggy today, we've drained her g-tube but she doesn't have ton of stuff coming out of it. Her hands and feet are still normal temps, although her heartrate is still fairly elevated. I'm not sure what tonight holds for us...I hope sleep, but if not I've got plenty of junk tv recorded to keep me awake. Reagan slept well last night (to my surprise). She woke up right around 9am but the smiles were gone. She had the wide eyed startled look on her face. She wasn't fussy, just tense. She watched some Sesame Street while I gave her medicines. Her nurse had put her pulse ox on and her resting heart rate was back up in the 150s. Then right around 10:15am I heard her pulse ox going off, I went in there and her heartrate was 186 (setting off the alarm) and she was throwing up. After she threw up, she fell asleep. Poor girl. She was really zonked. We changed her outfit, put her in the car, drove to the post office for our passport appt, took her in and did the whole appt without her ever waking up (thank goodness they accepted the picture of her before we chopped her hair...it was impossible to get another picture of her that fit all the strict requirements of a passport photo). I opted to NOT expedite her passport (and save $60) because we're right on the edge of the 4-6 week time line. Please keep it in your prayers that we get it back quickly so we're not panicking about whether or not it's going to come in time!!! We leave Sept 17th and that's just short of 6 weeks away. So exciting!!! Anyway, Reagan did wake up for a couple minutes just as we were leaving the passport office, but then I glanced back at her in her carseat and she was already back out again!!! She remained asleep and we even ran a few errands before coming back home. She made the transition into the house still asleep but then she only slept for another 30 min or so before waking up. She woke up, same as this morning. Not fussy, just wide eyed and tense. We did get a couple laughs out of her by making a high pitched sneezing sound. Of course, it was the saddest, most pathetic little laugh you've ever heard! She's definitely not feeling herself today. Very sleepy. Very sad. Hopefully she'll sleep tonight. She's still tired, but she's pretty restless. Please continue to keep her in your prayers!!! Reagan was a turkey last night. I'm not sure how much sleep she got, but she was awake, talking, and laughing most of the night. On a good note...she was a happy girl again today. I was a little worried after yesterday, but she was all smiles when Grandma went in to get her out of bed this morning and has been smiling ever since. She has been doing the crazy laughs all day today, thankfully it never escalated into crying. She's been super spitty today and I've seen her make the gaggy face a few times (usually when leaning too far back), but overall she's been able to handle it. I'm not sure what tomorrow holds...I'd love another good day (we are going in to do her passport tomorrow)...but I'm not counting on it. Hopefully this next bad streak will be a mild one. Right now she's only taking clonidine once a day at night, but I think when we hit bad days again, I'm going to start giving her an am dose as well. Maybe that will help? Please continue to keep her in your prayers!! Reagan slept OK last night. She was up til after midnight and then when she fell asleep, she'd sleep for a while and then wake up and be awake for a while. I know this went on a few times, but it's likely that she did it all night long. At 7am I went to pick up Grandma from the airport, by the time we got back Reagan was wide awake and smiling in her bed! She was definitely happy to see her Grandma. Reagan has been in a good mood all day. Lots of kicking around, rolling, trying to bite the sock off her hand (and at times accidentally biting herself). But I have noticed a few warning signs...which make me really nervous because we haven't had that many "good" days yet. She's been a little sensitive (flinching sometimes when you touch her), bitey, cold hands and feet, and then tonight she was doing the crazy laugh that turns into a cry. I don't know...I hope it's nothing. I'm not ready for more bad days just yet. She needs more good days...we all need more good days. Please keep her in your prayers. Reagan slept like a pro last night and woke up this morning right around 8:30am. Stretching and smiling...so nice to wake up happy! She's been a precious girl again today. Lots of smiles...talkative...but obsessed with her hand. If it's covered with a sock, it's in her mouth. If it's uncovered, it's in her hair pulling everything out. Even with the sock on, she's got it in her mouth at all times (usually trying to bite the sock off). She's super squirmy today. You can tell she wants to be on the floor rolling, when you pick her up and put her on your lap or in her chair, she just crunches in half and kicks her legs around! The only therapy she had today was speech and Reagan went to town with the cherry dum dum her therapist gave her. This girl has a sweet tooth! We started the day off with a nurse (the one filling in for our regular nurse)...and then I got a random call from the nursing agency saying that she had to leave and go into the office immediately. Something tells me they didn't have her paperwork in order (she's from out of state). Not surprising. So Reagan and I have had the whole afternoon to ourselves...which is nice except for the lifting! My back is still in bad shape, probably because I keep lifting her, but what choice do I have?!?! I spent the afternoon emailing back and forth (and finally talking over the phone) to the coordinator of the Stanford EPI-743 study (the new trial medicine for mitochondrial disease). The original dates we had been given were for the week of Oct 10th, then she offered for us to come in several weeks early during the week of Sept 26th, but that was literally the day after we get back from the Bahamas and just not an option. So we thought we'd just stick with our original date the week of Oct 10th. So all week I've been researching hotels and flights for those dates. Then today I get an email saying that the brain scan they have to do as part of the study, just won't be able to be done that week. Our options...to either come a week early (which would be only one week after we get back from the Bahamas) or come one week later. After giving it much thought, as much as I want to get her in this study and started on this med as soon as possible, it just doesn't make sense to put her through all of that traveling over such a short period of time. Not to mention, this way Mike will have 3 weeks back at work (instead of one), between the two trips. It just makes more sense. So the official dates will be Oct 19-21, with them actually starting the medicine on the 21st. We'll probably go a day or two early...Mike's company has a branch in San Jose (so he can get some business done) and we're also going to try to meet up with Zoey and her mom Heather, who has become one of my nearest and dearest friends (although I've never met her in person). So all in all, it should be a great trip. I hate to delay it, but I think this will put the least amount of stress on all of us! Here's to an unstressful, happy weekend...and sleep (it's 11:35pm and there's no sign of sleepiness with Miss Reagan). Reagan has been a precious girl today. She slept the whole night through (which is more than I can say for myself) and then she woke this morning all smiles. We loaded her into the car and took her straight back to the cardiologist to get the leads/fanny pack put on her for the 24hr EKG. It was super quick (and felt a little deja vu-ish...weren't we just here yesterday) and we were on our way back home in no time. Reagan was funny...even though she was awake and smiling, she was keeping her eyes either very squinted or closed! She did this a lot today. She had Speech this morning and fell asleep at the end of it. She took a little nap and then her PT woke her while getting a good stretch on those tight heel cords. She woke up happy and stayed awake the rest of the afternoon. We interviewed another potential nurse...who we got the feeling she thinks she's too qualified to work with us...she usually works with trach patients (code for...she doesn't have to do much interacting with most of her patients). She's supposed to fill in tomorrow when our usual nurse is out on vacation. We'll see. Then at 3:45pm, we headed back into town for another appt at the orthotics place (another deja vu moment). We spoke to them about a helmet for Reagan to keep her from biting herself. It was a quick appt. They just took some measurements and we told them what we are looking for. Hopefully they're able to make some adjustments to what's already available to keep those little fingers out of those razor sharp jaws on her bad days. Tonight Reagan has been all eyes. FINALLY...she's got those eyes wide open and looking right at us. Not sure why she's been so squinty today. We never know anything with this girl. Always guessing. Always. I'm just happy to have my sweet girl back!!! Reagan slept the whole night through...I don't think she moved a muscle all night! This morning we woke her up at 7:40 trying to change her out of her pjs for her cardiologist appt. We got there at 8:30am and didn't get out til after 11:30 (and still had to go get labs drawn). She did well, she smiled through the EKG and actually fell asleep during her echo. The doctor said everything looks great with her heart. No signs of cardiomyopathy (common with mito), no issues with anything really. Great news! She doesn't really think we need to treat her for her high heart rate (often times the body raises the heart rate to compensate for other issues), but she does want us monitoring her blood pressure (especially during her "bad" days) and if both her heart rate and blood pressure are getting too high, we may need to treat that just during her the bad cycles. She agrees that it's worth a try with the clonidine/diazapam to see if it helps the autonomic storms (although she seems to think it would be better to treat them as they come than to keep her on it all the time). One thing that she does want to do is send us home with a EKG "vest" and have Reagan wear it for 24hrs, just so they can watch her heart over a 24hr period. They want to do it twice, once on a good day and once on a bad day. They were actually going to put it on Reagan before we left today, but since she was so sleepy, I didn't really think this would have been a good representation of a normal day for her. I think we're going to head back first thing tomorrow morning and let them put it on her and she'll wear it all day and over night and we'll mail it back to them on Friday. Then next bad streak (presumably sometime next week), we'll go back in and have them put it on her again. The cardiologist we met with was very nice. She's one of two pediatric cardiologists that usually deal with the mitochondrial patients. She actually said the other cardiologist is probably a better fit for us (as she deals mainly with cardiomyopathy). He's an electrophysiologist/cardiologist that handles most of the mito kids with dysautonomia. So in two months we'll have a follow up appt to go over the results of the take home EKGs and talk to him about how Reagan is doing on the clonidine/diazapam. Reagan fell asleep in the car on the way home and slept the majority of the afternoon. She woke up for a couple hours and then fell right back to sleep again. She's a sleepy girl. We had to cancel both therapies scheduled today because she was out cold! Poor thing, during the short amount of time she was awake this afternoon, she started grunting and turning red. We assumed she needed to take care of some business...but nothing was coming out. I had to help her...she had the most rock hard (sharp) poop in there! I don't think she would have EVER gotten it out on her own (it barely came out with my help)! It was horrible. I felt so bad for her. I don't know why the Milk of Magnesia isn't doing the trick anymore. I think we're going to have to step it up a notch and give her a little more every day. Hopefully that will help! Tonight our girl is still really sleepy. She woke up for a short while but was hesitant to even open her eyes. She's back asleep now and hopefully she'll stay that way all night. My back is KILLING me and I don't know if I could get up in the middle of the night even if I wanted to!!! Hopefully we all get a good night's sleep tonight! We had a night nurse last night. Reagan slept off and on most of the night, but overall it did sound like she got a decent amount of sleep. We slept uninterrupted but I still woke off and on (due to my small bladder, back pain, and worrying about Reagan). She did well though. She was super quiet and cuddly last night and she's been that same way all day today. No laughs, but she's been a darling. She had another big throw up this morning (that's 3 mornings in a row now), but no real nausea to speak of. She was still moving her lips around a little (and had maybe a little more spit today) but she didn't really seem nauseous. Her hands and feet aren't cold any more but they are still a little clammy. I'm not exactly sure whether we're free and clear of the bad days or not. She's certainly been a good girl, that's for sure. She only had one therapy today, PT. We took some measurements with her AFOs on (she's 42 inches with her AFOs/shoes on) so that we can send off an application to AMBUCS for a special needs tricycle. They're pretty neat. They have ones with lots of support, straps to hold her feet on the pedals, arm braces to hold her hands on the handle bars, and even a push bar in the back so we can help her move! I think it would be pretty cool...hopefully we're able to get one for her! After PT she spent some time in her stander. She's such a good girl, we never hear a peep out of her when she's in her stander. Tomorrow we've got an early morning appt with cardiology. 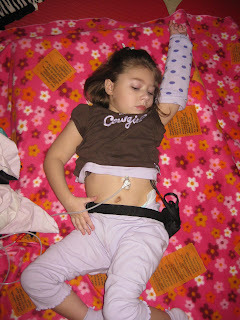 Even though she's had echos and EKGs (because of the mito), she's never actually had an appt with a cardiologist. Since we've discovered that she has an abnormally high heartrate, her special needs pediatrician decided it was time that we get her in to cardiology. I was told to expect a long appt! Fun. Please keep it in your prayers that our little one gets some sleep tonight and is in a decent mood for her appt tomorrow! Sleep last night was OK. Reagan started out in her bed, but that didn't last long. She started fussing so I picked her up and sat up with her til she fell back to sleep. I put her in her brown chair and she slept there for a few hours. Then around 4:30 she woke up again fussing so I got up with her again. She was back asleep (in her chair) in less than an hour and slept in til 9am! So overall, not a bad night's sleep for little miss Reagan. She even woke happy at 9am and was giving us laughs and smiles. She did have another big throw up this morning (it kind of came out of no where again) and then she's been moving her mouth around a lot like she's trying to manage her spit (even though she doesn't seem overly spitty today). I'm guessing this isn't the end of the nausea, but it sure would be nice if it was. Overall, this wasn't that bad of a day. Reagan had a few meltdown moments (when the nurse and I were talking and not giving her our full attention), with the big lip and tears, but all in all she's been a good girl today. Lots of little laughs. Big, huge eyes. Super sweet (we were even able to take her arm restraints off). I'm looking forward to some good days ahead...I just hope we don't have to go through another bad day to get to them! Please continue to keep her in your prayers.